(VOVWORLD) - The memorial service for former Party General Secretary Do Muoi took place on Sunday at the National Funeral Hall, No.5 Tran Thanh Tong Street, Hanoi. 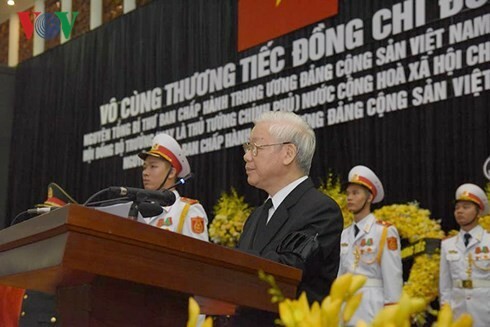 Present at the ceremony were Party General Secretary Nguyen Phu Trong, Prime Minister Nguyen Xuan Phuc, Acting President Dang Thi Ngoc Thinh, other senior leaders, and former leaders of Vietnam. 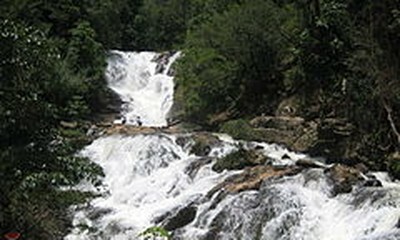 The Lao delegation to the service was headed by Thongloun Sisoulith, member of the Lao People’s Revolutionary Party’s Politburo and Prime Minister of Laos. 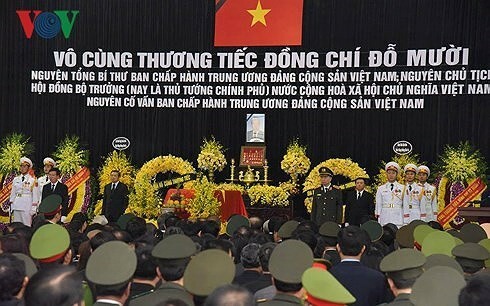 The memorial ceremony for former Party leader Do Muoi was held simultaneously in Reunification Hall, Ho Chi Minh City. The burial service for former Party leader Do Muoi took place the same day in his native village in Thanh Tri district, Hanoi. Former Party leader Do Muoi passed away on October 1, 2018. Over the past few days, more than 1,600 delegations with more than 60,000 representatives of organizations and individuals came to the National Funeral Hall in Hanoi to pay tribute to the former Party leader. More than 100 diplomatic delegations and 3 high-ranking delegations of Lao, Cambodia, and Cuba came to pay last respects to Mr. Do Muoi. Leaders of several countries have sent condolences to the Vietnamese Party, State and people and family of former Party leader Do Muoi. General Secretary of the Communist Party of India Sudhakar Reddy, General Secretary of the Communist Party of Uruguay Juan Castillo and Secretary for External Relations Jorge Mazzarovich, General Secretary of the Communist Party of Turkey Keman Kemal Okuyan, and President of the Freedom Party of the Republic of Korea Kim Byong Joon sent condolences to Party leader Nguyen Phu Trong of the passing of former Party leader Do Muoi. Leaders of Communist Parties of Portugal and Brazil also sent condolences to the Vietnam Party Central Committee.